Door hangers are the best way to attract businesses within a specific area. They’re popular with restaurants advertising their take-out menus. But other industries have also stepped in and now use of door hangers to promote their business. Our door hangers are printed on 14 pt. cardstock. They have a hole that’s 1” in diameter so they can fit on any door knob no matter the size. Door hangers are a simple, effective marketing tool with scores of uses. 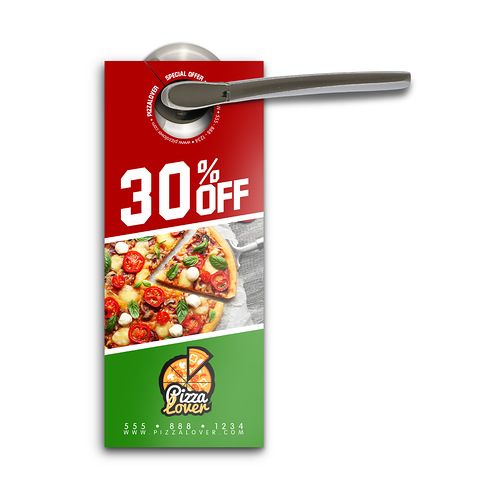 Use door hanger printing to announce a special sale or event, create buzz about a new business in the area, or introduce a longstanding business to potential new customers. Door hanger printing and advertising can also be used at conferences at a host hotel to promote the schedule of seminars, activities, and other special events. You can also get rip hangers, which are door hangers with a tear-away section which can hold business cards or coupons. For door hanger promotional tips, check out our door hanger marketing ideas. Door hangers can be printed as fast as 48 hours.